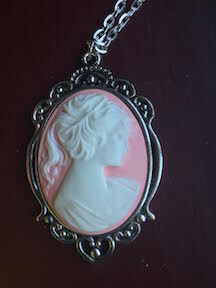 Jeanette will be awarding a Victorian cameo to a randomly drawn winner (international) via Rafflecopter during the tour. Click here for the Rafflecopter. Click the banner above to follow the tour and increase your chances of winning. Jeanette: There are two expressions that always keep my life in perspective. Susana: One of them is “I’d rather be lucky than good.” There are always millions of people around the world with incredible talents. But the vast majority never get that “Lucky Break” that makes a would-be actress into a star, or a good basketball player into a national hero. Jeanette: My second expression is “The stitch ripper is your friend…be one with the stitch ripper.” I sew. A lot. I always have friends over to sew with me. I’ve taught a lot of people how to sew. Part of sewing is making a mistake, and having to rip out the stitches and do it again. Some people find a lot of shame in making these mistakes, I came up with this mantra to take away some of the stress. Sewing is like life. We all make mistakes. The nice thing about sewing, we can rip out the stitches and we get a do-over. How awesome is that? Susana: When was the moment that you knew you had to be a writer? Jeanette: When I was in 5th and 6th grade, I used to make up stories in my head and tell them to my best friend while we were walking to school. I’d have an ongoing serial, and every day I’d give her the new installment. One day, she dragged me over to another friend of ours, and she told me to tell one of my stories to this other person. I tried to reproduce it as best I could, but I kept leaving out details. That’s when my best friend exclaimed, “What do you mean, you aren’t writing these down? !” She changed my life that day. I’ve been a writer ever since. Jeanette: The biography of Amelia Bloomer. I absolutely adore biographies! David McCullough is awesome, although I’ll read all sorts of different authors. Jeanette: The characters, of course! A writer can have a plot in mind, but characters who really come to life take on a spirit of their own, and they will derail your plot. When that happens, all you can do is run with it. If you try to force the characters to suit the plot, it is always to the detriment of the story. You have to stay true to the characters. Jeanette: Margaret Mitchell. Gone With the Wind is the one book that has had a huge impact on my writing. She did her homework, then did some more, then did some more. The characters may be fictional, but the eyewitness account she gives of the Civil War and Reconstruction are spot on. I spent a lot of years researching for Wealth and Privilege, because I needed to live up to that standard. Jeanette: That I don’t actually own dogs. My husband is allergic to everything with fur, so I can’t have any pets. And no, I’m not interested in fish. So Anthra and Bit are the fantasy dogs I would have if I could. I love labs! Jeanette: Greece. I have had one particular love story floating around in my head for something like 20 years. I haven’t written it down because I haven’t figured out the setting yet. Is it science fiction or fantasy? Is it a contemporary drama? Is it historic fiction? I think I found my answer when we went to Athens and Sparta on vacation. I think I want to set it during the Peloponnesian War. Jeanette: I had two English professors at the University of Wisconsin-Madison who had policies that will be with me all my life. One professor used to hand out writing assignments and say “Just be brilliant!” His view on the world was that if you treat people like geniuses, they will perform like geniuses. If you treat them like idiots, they will behave like idiots. I did some of my best writing for him, just because he told me to. This is less writing advice than it is life advice, but I learned it in a writing class. The other English professor was this stern and somewhat intimidating fellow who surprised the hell out of me when he told my class that if they were having trouble getting ideas written out on paper because they were censoring things before they were written out, just “give your internal censor a shot and tell it to go to sleep for awhile.” While I don’t recommend becoming an alcoholic, I do think the fundamental advice is very sound. Get everything down on paper, THEN go back and edit. Susana: What are your favorite pastimes? Jeanette: I’m a seamstress, a dancer, and a fencer (although I haven’t done it for a couple of years, and I miss it terribly). I do all kinds of different dance forms – everything BUT tap, jazz and ballet. That includes international folk dancing, and swing dancing, and belly dance. I want the opportunity to take up Argentine Tango. I also am always working on our house. We’ve just finished remodeling the kitchen, so now I’m eyeing the peeling paint in the dining room. I’ve refinished woodwork in several parts of our house. Paint is the devil, and should never be applied to gorgeous pieces of oak. Jeanette: Starting a Cancan troupe. It’s called Madame Gigi’s Outrageous French Cancan Dancers. I started with me, two yoga instructors, two teenagers, an elementary school teacher and my living room. We borrowed pettipants, made the petticoats, and had no clue what we were doing. Now I have 15 dancers, including men, we dance at the biggest Bastille Day festival in the country, we’ve done more television appearances than we can count, and we have had invitations from Boston to San Diego to Hong Kong (which, sadly, fell through). The dancers keep getting better, the costumes keep getting better, the audiences keep getting bigger. It’s been an amazing journey! Jeanette: As tempted as I am to say my iPhone, because I’m totally addicted to it, I’m going to name the less newly-minted automobile. I know I could get by without my phone if I had to. But I don’t want to think about not being able to get in a vehicle and drive to another city for a dance, or back to Wisconsin to see friends, or out to some exciting new city for a book signing! I love to travel. Life without the ability to go places? Horrifying. Thomas Baldwin finds himself married to a woman he can’t stand, while head-over heels in love with another woman he can’t have. Talk about bad planning. He feels like a kite, buffeted by circumstances which blow him not only through personal crises, but also through some of the most significant events in Pittsburgh during the late 1800s, including the railroad riots of 1877, the creation of the Homestead Steel Works, the assassination of President Garfield, and the Johnstown Flood. Over time, and with the help of his muse, who dances maddeningly just beyond his reach, he takes control of his life, wresting it from the winds attempting to control him. A soft rumble of thunder sounded in the distance, and they both groaned. “Well, I suppose thunder doesn’t necessarily mean more rain,” Regina answered hopefully. It was an odd sort of thunder. It took Thomas a moment to realize why. Then it occurred to him that it was continuous, and getting louder, instead of fading away. A strange black fog began to drift through the air. They froze, staring at each other, listening. The rumble increased like – what? It was a cross between an oncoming train, and – and – Thomas imagined this must be what an avalanche must sound like. Then he knew what was going on. The South Fork dam had broken! Before he could share his insight, Regina’s face changed. She stared up Clinton Street, mouth open, eyes wide with horror. She pointed, incoherent noises issuing from her throat. Thomas turned, and nearly fell off their precarious little raft. The source of the crashing rumble was a towering wall of debris moving toward them. A misty black cloud hung in the air, occasionally obscuring the horrific sight. A writhing mass of tree roots, rooftops, planks, railroad pieces and other metal parts tumbled over and over upon itself. The rumble had clarified into a roar of screaming and crashing as the rapidly approaching behemoth rolled toward them. They couldn’t outrun it, either on or off their little craft. Regina pointed to the nearest building. The brick corners were coined, laid unevenly enough to make a decent ladder. Thomas understood without a word. They poled their way across the watery distance, desperation giving them strength and speed. Jeanette Watts has written television commercials, marketing newspapers, stage melodramas, four screenplays, three novels, and a textbook on waltzing. 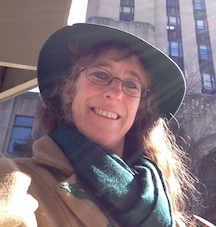 When she isn’t writing, she teaches social ballroom dances, refinishes various parts of her house, and sews historical costumes and dance costumes for her Cancan troupe.